Walt Disney World is a truly magical vacation destination for guests of all ages thanks to its endless experiences. The property is home to four theme parks, two water parks, Disney Springs, over two dozen Disney Resorts, hundreds of dining locations, entertainment, recreation, and more. With so much to see and enjoy, many guests love to spend a ton of time in the Magic Kingdom enjoying all that it has to offer. The park opened with Walt Disney World in 1971 and is home to themed lands that transport guests to different places in time, location, and imagination through wonderful attractions and entertainment. The Magic Kingdom is filled with classic experiences that guests love to enjoy on each Walt Disney World vacation, and most guests want to make the most out of each moment in the park. This can be hard to do with so much to enjoy, and there are definitely some rookie mistakes that many guests make that end up costing them time and energy. By avoiding these rookie mistakes, guests are sure to make the most out of their time in the Magic Kingdom and see as much as possible. Here re twelve rookie mistakes that guests make at Walt Disney World’s Magic Kingdom. One of the easiest ways to make the most of each day at the Magic Kingdom is by arriving for rope drop. This entails getting to the park before it officially opens where guests are allowed into Main Street and can shop in the various stores, pick up breakfast in the Main Street Bakery, or enjoy the welcome show in front of Cinderella Castle. Once it is officially time to open the park, guests who have arrived early for rope drop are already near where they want to head for the day and get beat many of the crowds. Many guests head straight for Tomorrowland first thing in the morning, but that means that the attractions found there are going to be more crowded and have longer lines than other areas of the park. Guests should instead plan on heading to Frontierland first thing in the morning to enjoy Splash Mountain and Big Thunder Mountain Railroad with low wait times. The Magic Kingdom is home to many popular and thrilling attractions that guests love to enjoy on each visit to the park, but there are also plenty of underrated attractions that guests often overlook. These underrated attractions might not be as popular as others, but they are wonderful in their own ways and should not be missed. Some underrated attractions to enjoy include Walt Disney’s Enchanted Tiki Room, Country Bear Jamboree, the Tomorrowland Transit Authority PeopleMover, and Walt Disney’s Carousel of Progress. New Fantasyland is home to one of the most popular attractions in the Magic Kingdom that tends to easily have long wait times on busy days in the park. The Seven Dwarfs Mine Train invites guests to journey into the mines where the dwarfs work and a million diamonds shine. Since the attraction is so popular, guests who would like to enjoy it should opt to book a FastPass for the experience to avoid spending lots of time waiting on line. Another popular attraction in Fantasyland is a classic that many guests consider a must do on each visit to the Magic Kingdom. Peter Pan’s Flight brings guests on a magical journey high above the sights of London and Neverland with Peter, Tinkerbell, and the Darling children. Peter Pan’s Flight typically has wait times that exceed well over an hour, so guests are smart to book a FastPass for the experience to save themselves time. Tomorrowland in the Magic Kingdom is home to a very popular attraction that blasts guests off into the thrilling darkness of space. Space Mountain brings guests into Starport 75, an intergalactic space hub that can blast guests off to all corners of the universe. 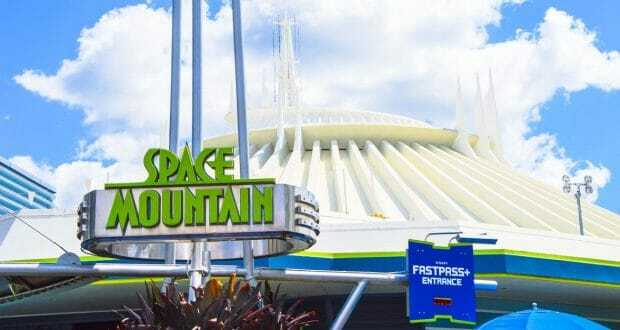 Space Mountain is extremely popular with guests, making it a great option for a FastPass in the Magic Kingdom. Each afternoon the Magic Kingdom is host to a whimsical and wonderful parade that begins in Frontierland before working its way through Liberty Square and down Main Street. The Festival of Fantasy parade runs each and every afternoon, weather permitting, and features floats that showcase favorite Disney characters including Anna, Elsa, Pinocchio, and Mickey. The floats are kinetic and exciting, and guests absolutely love the characters and the music. The Magic Kingdom is home to many dining locations including a few full service options that guests are sure to love. Guests looking to enjoy a relaxing meal in the park can head to New Fantasyland to enjoy a meal in Be Our Guest Restaurant which brings them into the Beast’s Castle. Another favorite full service option is The Plaza Restaurant which combines turn of the century charm, stunning views of Cinderella Castle, and delicious food. One of the biggest rookie mistakes that guests make in the Magic Kingdom is not meeting the mouse himself. Mickey can be found at Town Square Theater where he is decked out in his magician’s finest! He is always so willing to offer hugs and autographs, and pose for photos which always turn out amazing thanks to a Disney’s PhotoPass Cast Member. While all of the lands in the Magic Kingdom are popular, Fantasyland always seems to be the most crowded since it is home to attractions that are options for guests of every age. Rookies often tend to visit Fantasyland during the mornings or afternoons when the area is the most crowded. The best times to visit the land are during the afternoon parade, or late at night when many guests with small children have headed home for the day. One of the best ways to make the most of each moment in the Magic Kingdom s by taking advantage of Extra Magic Hours. These special times in the park are available to guests who stay on property at a Disney Resort and typically include getting into one park an hour early each morning and remaining in another several hours later than normal each night. Extra Magic Hours are a great time to enjoy the Magic Kingdom as there are fewer crowds and lower wait times on popular attractions. No day in the Magic Kingdom is complete without enjoying the nightly fireworks, and guests are smart to find their spots early. Happily Ever After combines projections, fireworks, special effects, and wonderful Disney music for an unforgettable experience centered around Cinderella Castle. Since the show is so popular, guests find their spots very early, making it hard to find a spot right before show time. Guests who would like to enjoy the perfect view of Happily Ever After should plan on finding their spot at least an hour before show time. Caitlin Kane first visited Walt Disney World when she was two years old, and despite spending most of the trip quarantined with the chicken pox she managed to fall in love with the place. Visiting WDW every year since, she especially loves learning about the history and small details of the parks, enjoying a Lapu Lapu, and eating/drinking her way through the Epcot International Food & Wine Festival. When she's not in Disney, Caitlin lives in New York teaching preschool and spending her time counting down the days to her next trip.